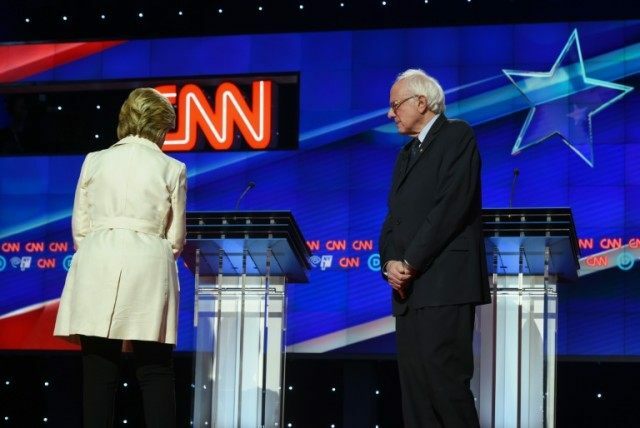 New York (AFP) – Hillary Clinton and Bernie Sanders came to blows in a heated US presidential debate in Brooklyn, raising the stakes in their increasingly acrimonious race to clinch the Democratic nomination. They attacked each other on the economy, climate change, gun control, race issues, Libya and Israel, in the ninth Democratic presidential debate just days before the key New York primary, when 247 party delegates will be up for grabs. The former secretary of state holds a 13.8-point lead over the Vermont senator in the New York polls and needs a commanding win in Tuesday’s primary after losing seven of the last eight contests to her leftist rival. It was the most combative performance yet between the ex-New York senator, who advocates incremental but realistic reforms, and her challenger, who calls himself a democratic socialist and advocates a political revolution. Each accused the other of failing to answer questions and clashed over the longevity of Clinton’s support for the $15 minimum wage, her support for regime change in Iraq and Libya, and their judgement. The Brooklyn-born Sanders harangued Clinton for supporting fracking overseas and mocked her over her ties to Wall Street and her insistence that she stood up against the behavior of banks as New York senator from 2001-09. “Senator Sanders did call me unqualified. I’ve been called a lot of things in my life, that was a first,” she said. “Questioning my judgment, well the people of New York voted for me twice to be their senator,” she said to cheers. New York is a vital battleground for Sanders, who must beat Clinton to keep alive his dream of wresting the nomination from the Democratic frontrunner. His passionate call for a sweeping changes to campaign finance, free college education and universal healthcare have galvanized young people, but Clinton has won more than two million more votes in state elections so far. She holds 1,790 delegates compared to 1,113 for Sanders, putting her on course to scoop the 2,383 needed to secure the party’s ticket for the White House, where she last lived as first lady from 1993-2001. “It’s easy to diagnose the problem, it’s harder to do something about the problem,” Clinton needled. “Incrementalism and those little steps are not enough, not right now, not on climate change,” her opponent hit back. She ignored pleas to release transcripts of paid speeches to investment banks while Sanders promised to release his 2014 tax returns on Friday. “Jane does our taxes, we’ve been a little bit busy lately, you will excuse us,” Sanders said testily of his wife when asked why it had taken him so long. Clinton has released years of tax returns. Clinton criticized her opponent for failing to detail how he would implement his sweeping promises and stressed the depth of her experience, portraying herself as Barack Obama’s heir. She also laid into Sanders’s weak record on gun control, pilloring an interview that he gave the New York Daily News saying that he did not support a lawsuit brought by families of the victims of a 2012 shooting at an elementary school in Connecticut against the gunmaker whose rifle was used. Clinton, who commands huge support among African Americans, apologized for “unintended” consequences of a crime bill passed by her husband Bill Clinton that fanned the prison population and disproportionately targeted blacks. “It was a racist term and everybody knew it was a racist term,” Sanders said, criticising Clinton for using the term “superpredators” in the 1990s. A significant haul of 247 Democratic delegates are up for grabs in the New York primary, where minorities and wealthy Democrats are likely to favor Clinton, although polls suggest that Sanders has narrowed her lead. The state also contributes 44 superdelegates, and the rules — which allow only registered Democrats to vote — favor Clinton. Sanders has performed best in primaries that are open to independent voters. With Republican frontrunner Donald Trump potentially facing a contested nomination and Clinton a tighter national race than she would have liked, New York may play its most decisive role in decades in a presidential election.